SAVE up to $45 / person! BEST DEAL ON KNOTT'S SCARY FARM TICKETS! Only $46 for regular admission and $42 for children aged 3-11, or ages 62 and over. 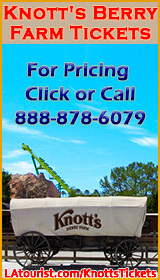 Knott's offers a full day of fun for less than half the cost of Disneyland! Amusement Parks, Shopping Centers and Malls, Hollywood, Things to do near Los Angeles International Airport (LAX), Free Tourist Activities, Sightseeing, Tourist Attraction Links, Museums, Outdoor Activities and Los Angeles Travel Guides. Find out how to be in the studio audience for game shows, attend free TV talk shows or even be in a movie! Some game shows choose participants from the audience. One website recruits people to be extras in movies. Los Angeles is a world-class premium shopping destination. Not only do we have a variety of stores to suit every taste and budget; we also have several different types of shopping venues. This list of Los Angeles-area malls, shopping districts (such as the Grove and Third Street Promenade) and open-air markets is organized by location. It includes factory outlets and farmers markets. 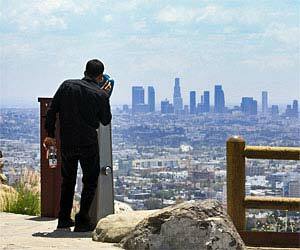 A variety of Los Angeles guided tours that you can purchase online, from the time-tested Grand Tour to the brand-new helicopter tours. See beaches, movie star homes, downtown and all of the attractions through the eyes of an expert! This is a great way to explore our great city, even if you've been here before. A huge list of guided tours in Los Angeles, including tours from Hollywood Boulevard, Walking Tours, Private Tour Guides, Tips on taking a guided tour and more! This list includes company names, website links, pictures of the vans and phone numbers! Los Angeles hosts a number of world-famous sports teams, including professional organizations like the Dodgers and the Lakers, as well as college teams such as the UCLA Bruins and the USC Trojans. See the list of Venues for links to sports centers such as Los Angeles Memorial Coliseum and Staples Center. How to get Free Visitors Guides from local visitors bureaus, as well as vacation brochures and publications from travel companies and attractions. There are also lists of tourist bureaus, government links, sports teams and sporting events, and Los Angeles venues (such as Staples Center, Greek Theatre, etc). View recommended hotels near LA International Airport (LAX), Hollywood, downtown Los Angeles, Disneyland, Universal Studios, Beverly Hills, beach cities, West LA and other tourist destinations. 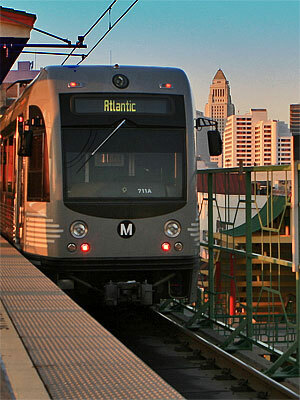 There is a list of hotels near Metro Red Line train stations, where the rates are lower. You can find early booking discounts and multi-night discounts when you make reservations online. There are options ranging from budget motels all the way up to 5-star luxury hotels and resorts. Some ideas on what to do during an extended layover at Los Angeles International Airport. Includes Shopping, Beaches, Hollywood, Downtown, Museums and more. Hollywood attracts millions of visitors each year who travel there to pay homage to their favorite stars and perhaps even catch a glimpse of a few famous personalities. Sometimes they're lucky! On these pages you'll find famous Hollywood landmarks such as the Walk of Fame (stars on the sidewalk), the Hollywood Sign, the Hollywood Bowl and more. There are links to the Hollywood tourist sites such as the landmarks, as well as attractions like Hollywood and Highland entertainment center and Madame Tussaud's showcase of celebrities. Southern California is home to a number of world-famous theme parks, including Universal Studios, Disneyland, Knott's Berry Farm, Magic Mountain, Sea World, LEGOLAND, San Diego Zoo and many more. This list covers Los Angeles, Anaheim and San Diego. Southern California's most popular amusement park, with about 18 million visitors in attendance during 2015. In the same year, Disneyland's sister park, California Adventure, drew around 9 million visitors. Information on bus and train routes and schedules. Public transportation in Los Angeles is much better than you think! You might not have to rent a car if you use MTA's Metro Trip Planner to find the best location to rent a hotel. Although it only spans 5.7 square miles, this little city is a world-class destination, attracting millions of visitors each year who are hoping to take some of its glitz and glamour home with them. Visitors from around the world frequent Beverly Hills in droves, searching for stars and frequenting its chichi stores, boutiques and eateries. Living up to its illustrious reputation, the city offers an exceptional selection of five-star hotels. L.A.'s most popular beach, Santa Monica offers ocean sights and activities, shopping, people watching, street performers and more. The most famous attractions are the Santa Monica Pier, the Third Street Promenade and the newly renovated Santa Monica Place mall. Attractions in Malibu including oceanside restaurants, museums, beaches, wineries that have tasting rooms and more. Tourist attractions near Marina del Rey in Los Angeles. Includes Fisherman's Village, High-end Restaurants on the Marina, Venice Beach near Washington Boulevard, Mother's Beach, Burton W. Chace Park, Marina del Rey WaterBus, Free Summer Concerts and more. Marina del Rey is the beach destination that is closest to L.A. International Airport (LAX). 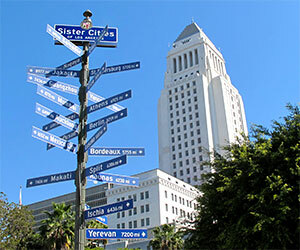 Tourist attractions in downtown Los Angeles, plus information on how to go on free guided tours. See Disney Hall plus the Performing Arts Center, MOCA museums, Little Tokyo, Olvera Street, the Jewelry District and other popular sites. Things to do in Long Beach near Shoreline Village (including Aquarium of the Pacific), downtown Long Beach, sightseeing near the Queen Mary, San Pedro attractions near Long Beach and more. A list of dining guides, restaurant locators and reservation services. This is not a list of restaurants, but a list of some of the best online dining guides for Los Angeles. Los Angeles events listings and calendars. Includes links to websites with large listings of events, as well as events by ethnicity and special interest. Most popular pages: Tourist Attractions, Hollywood, Disneyland, Shopping and more. This 5-day Tourist Itinerary includes major Hollywood and Los Angeles attractions and is designed to maximize your vacation time. You will hit the ground running with a Grand Tour of Los Angeles, and you will keep busy every day. 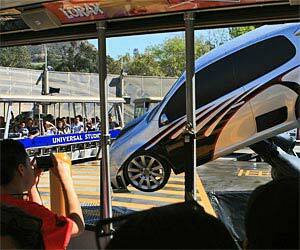 Rental car is not required, because the Itinerary focuses on guided tours and attractions near the Red Line train. You can skip the driving hassles and use the extra money to have more fun! Pictures of Los Angeles, including Universal Studios, Beverly Hills, Transportations, Hotels, Santa Monica, Disneyland, Knott's Berry Farm, Los Angeles, Hollywood, Southern California, Hollywood Sign, Outside of LA, and others.